Easily grown in organically rich, well-drained soil in full sun to part shade. Prefers part shade in hot summer climates. Needs regular moisture. Promptly remove spent flower stems to encourage additional bloom and to prevent unwanted self-seeding. Plants spread by both rhizomes and self-seeding (seeds have silky seed hairs which facilitate easy dispersal by the wind to remote areas). This plant can be both persistent and aggressive in garden areas. Chamerion angustifolium, commonly known as fireweed, is a robust strongly-spreading, rhizomatous perennial wildflower that grows to 2-5’ tall on upright, often reddish, primarily unbranched, stiff woody stems clad with alternate, narrow-lanceolate or linear, pinnately-veined, willow-like leaves (to 2-6” long and 3/4” wide) and topped by an elongated terminal cluster (raceme to 3-8” long) of open, saucer-shaped, 4-petaled, bright pink to lilac-purple (rarely white) outward-facing flowers with protruding stigmas which bloom in summer (June-September). Flowers bloom bottom to top on each raceme which can simultaneously have seed pods at the bottom, blooming flowers in the middle and unopened flower buds at the top. Flowers are usually ornamentally stunning in bloom. This plant is circumpolar, being native throughout the temperate Northern Hemisphere. In North America, it is found in a variety of locations including open woods, roadsides, open fields, pastures, prairies, hills, damp ravines, logged and burned areas, and especially along streams, in damp places and on disturbed sites from low valleys to tree line in the mountains. It is native to Alaska, all Canadian provinces and territories, and in a wide distribution in the northern U. S. states dipping southward in the Appalachian Mountains to Georgia and in the Rocky Mountains to Colorado and in the Sierra Mountains to California. It is absent from the hot and humid southeastern U.S. and Texas. 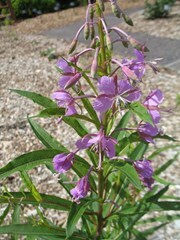 This fireweed was originally known by the synonymous name of Epilobium angustifolium, but was transferred from Epilobium to the genus Chamerion because of certain major differences: (a) absence of a floral tube, (b) flowers are bilaterally symmetrical, (c) stamens are subequal, and (d) leaves are spirally arranged (alternate). Genus name comes from the Greek words chamai meaning dwarf and nerion meaning oleander in reference to the resemblance of plant leaves to those of oleander. Specific epithet comes from the Latin words angustus meaning narrow and folium meaning leaf. Common name is in reference of the often sudden appearance of plant seedlings in areas previously devastated by wild fires or volcanos. By way of example, one year after Mount St. Helens erupted in 1980 in Washington State, 81% of the seedlings present were from fireweed. In Great Britain, this fireweed acquired the common name of bombweed during WWII because of its ability to rapidly colonize bomb craters. No serious insect or disease problems. Some susceptibility to powdery mildew, downy mildew, rust and fungal leaf spots. Snails and slugs are occasional visitors. Group or mass. Rock gardens, borders, cottage gardens or informal naturalized areas.